Provocative questions on the minds of young people but too often unaddressed in classrooms and in society are what shape Created Equal: Can everyone achieve the American Dream if they worked hard enough? How much is “enough”? What makes people happy? Created Equal is a curriculum that facilitates conversations across class lines leading towards social economic justice dialogue. 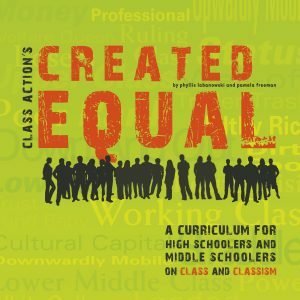 Created Equal provides facilitators and teachers with links to videos, podcasts, online games, websites, organizations and other resources to help guide conversations about class, economic justice, and financial literacy. Created Equal provides an opportunity to gain a better understanding of class issues, develop analytical skills, and practice being kind along the way. Created Equal is being used by educators at high schools, faith-based programs, after-school programs, teen empowerment projects and other groups across the nation. Listen to the full interview here: Radio With A View – Created Equal. Education is supposed to equalize the playing field, yet schools often become places of reproduction and reinforcement of class inequities. This contradiction makes schools an especially crucial site for raising class awareness and equipping students to work towards a world we are all truly “created equal.” The curriculum tackles the class questions young people find most pressing in a series of engaging activities, discussion guides, and multi-media “hooks” that facilitate students in discovering more about their own class background, the experiences of others and how to create alliances toward a shared goal of fairness and equality. Everyone benefits from open and respectful conversations about class and classism-young people and the adults in their lives. Created Equal provides an opportunity to begin or to continue that journey, into an understanding of the issues and a development of the skills needed along the way. In doing so, we hope that Created Equal will support a generation of young people who understand the impact of classism on all of us, who are able to have respectful conversations across class lines, and who are willing to work for economic justice. Most people are not in a hurry to talk about the ways they are different, especially when those conversations reveal that some of us are privileged (which often brings up feelings of embarrassment or guilt) and others are truly disadvantaged (which often brings up feelings of shame or anger). Both research and people’s lived experiences identify the ways institutions perpetuate and maintain classism. Our class backgrounds inform who we are, what we value, how we communicate, and who we become. Whether we acknowledge it or not, we often identify the class of others and treat them accordingly, based on these presumed identities. Holding the contradictions-our own, each other’s and in the culture and institutions around us-is a skill everyone needs in a diverse society. We cannot walk in each other’s shoes, but we can walk together as allies. Given the vision we have for a world where education can make the difference, secondary schools are especially crucial sites for the implementation of this curriculum. To you who are helping to make that difference, we give thanks. If you have any questions about Created Equal feel free to contact Class Action at info@classism.org. You can order copies at our online store. To donate to Class Action to help bring Created Equal to more youth, click here. 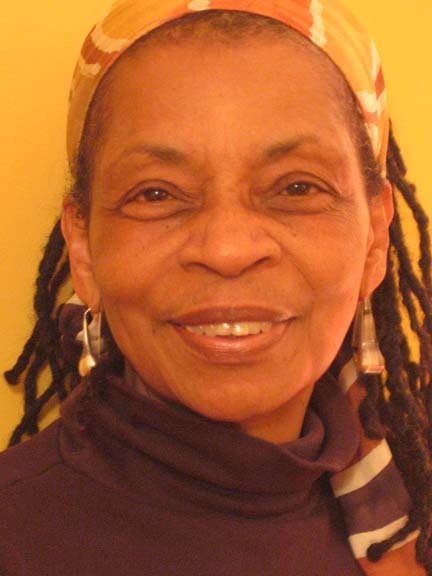 Pamela Freeman is a long time social activist. She has spent the last 30 years working on issues of social justice, nationally and internationally in variety of settings. She is the founder of the Philadelphia Black Women’s Health Project which advocates round health issues for Black women. She is a graduate of the School of Playback Theater, and the co-founder of Playback for Change a local improves company that focus on diversity issues. She also was a consultant/trainer for Spirit in Action, an organization that provides training around diversity and class issues for social activists. She is a social worker by training and currently teaches cultural diversity at Bryn Mawr College School of Social Work and Social Research as well as works as a therapist. Phyllis Labanowski is a stepmother, grandmother, godmother, and aunt-so she takes our future seriously. She suffered 12 years of bad teachers growing up in the public schools of rural, up-state New York-so she became a teacher. She was raised in a racist, sexist, homophobic, anti-Semitic, working class, Polish family-so she became an activist. As a result of hearing the collective visions of activists and organizers nation-wide and the role of artists in those visions, she went to the School of the Museum of Fine Arts in Boston at age 50. Now she is a graphic messenger supporting people and organizations that are doing good work in the world and is also working on contemporary public ceremony through Water Dances and Land Rituals.